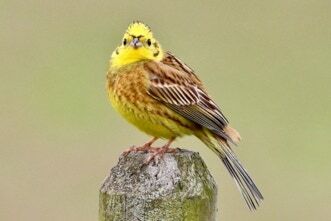 The yellowhammer is a passerine in the bunting family often seen perched on the top of a hedge or bush with their bright yellow heads and underparts and their brown backs and chestnut rump. They have declined over the years and are now a red list species. 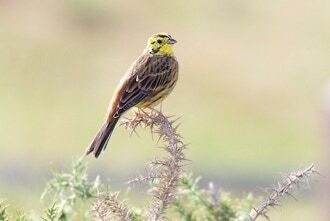 However they are on the increase in Scotland and the bird below was photographed on the Isle of Mull. 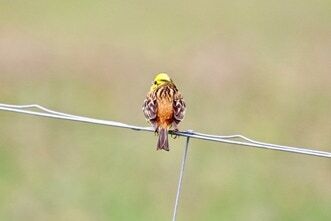 They build their nests on or near the ground and have between 2 and 3 broods per season.The female incubates and the male feeds her. They then both feed the young.